I love visiting Germany. I've been there several times, but admittedly, I have only ever seen and explored southern Germany. Strangely enough, I have never really been to any other parts of the country except for a day and a half in Düsseldorf in western Germany while en route to the Middle East. This means I have never been to Berlin, which is a place everyone frequently raves about. However, I'm confident that I will return to Germany in the future, and I will be sure to visit more parts of the country since they tend to be quite diverse in terms of culture. A few years ago, I had the opportunity to spend three weeks in Germany, but I actually only had one week to explore since I was taking a two-week German course in Munich. For this trip, I was determined to see a lot of different places in southern Germany since I was not sure when I would have the chance again. After the course ended, I spent my free week exploring the areas surrounding Munich. In order to accomplish this goal, I bought a rail pass that allowed me to use the different trains throughout the Germany. This turned out to be a godsend since it allowed me to ultimately visit six different cities and towns in Bavaria in the course of a week. I truly wish I had more time though. Southern Germany is sprinkled with tons of things to see and do, and a serious traveler who wants to explore in depth or a casual visitor who wants to get a feel for the region will discover many fascinating and wonderful things. Here is a list of 10 beautiful places to visit in southern Germany. 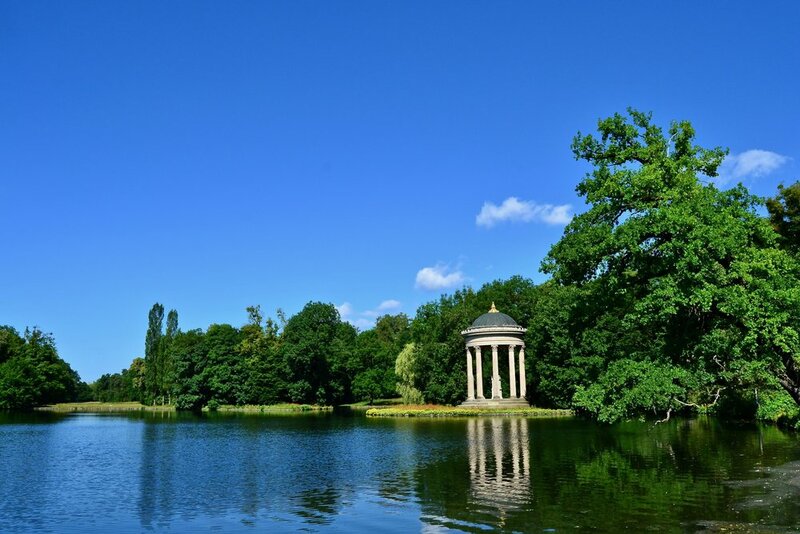 All of these places (except two which are in Munich) can be done as day trips from Munich using public transportation, but depending on your preference, you might want to spend a night or two in a couple of the places if you want to explore the area further. Please enjoy the photo galleries. All photos were taken by me using a DSLR and iPhone. Fürstenfeld Abbey (Kloster Fürstenfeld) is a gorgeous 18th-century church that is an artistic masterpiece and a must-see for anyone interested in art and architecture. Fürstenfeld Abbey is a very easy and quick site to get to from Munich. The easiest way to reach the abbey is to go by train. From Munich Hauptbanhof, the ride to the town of Fürstenfeldbruck takes just under half an hour, so it is quite close to Munich. The abbey is located fairly close to the train station and is literally a straight walk with no turns or complicated directions needed. All one needs to do is get off the train and follow the tracks in the direction away from Munich. Eventually, the tower of the abbey church will appear. Enjoy the walk there. It is quite picturesque and a relatively quiet area, especially in the morning when not very many people are out. I first saw pictures of the interior of the abbey church years ago as a university student. Back then, the thought of seeing this particular place in person might as well have been a pipe dream, but life has a strange way of working out. On the day I went, I had high expectations about what to see, and I was not disappointed. When I had arrived, a church service was in progress, so I needed to wait until it was complete, but once it was over, no one had a problem with me walking around, checking things out, and taking photos without flash (aber ohne blitz). Like other churches in this region, one of the more macabre aspects of this edifice is it holds the skeletal remains of a couple supposed saints named "St. Hyacinth" and "St. Clemens." These "catacomb saints" are literally skeletons that were supposedly taken from the Roman catacombs during the 17th century and enshrined in their current locations. Even though there is no definitive proof of who these people actually were; let alone their real names, a belief and cult of devotion has developed around them amongst the faithful. Because these skeletons are seen as martyrs and popularly believed to have been, they are often decked out in jewelry-covered clothing that is fitting for a saint. The Peterskirche in Munich also has a very nice example of a skeletal "catacomb saint" on display in a side chapel as well. These "catacomb saints" can be found throughout the region and are often quite beautiful albeit rather creepy. 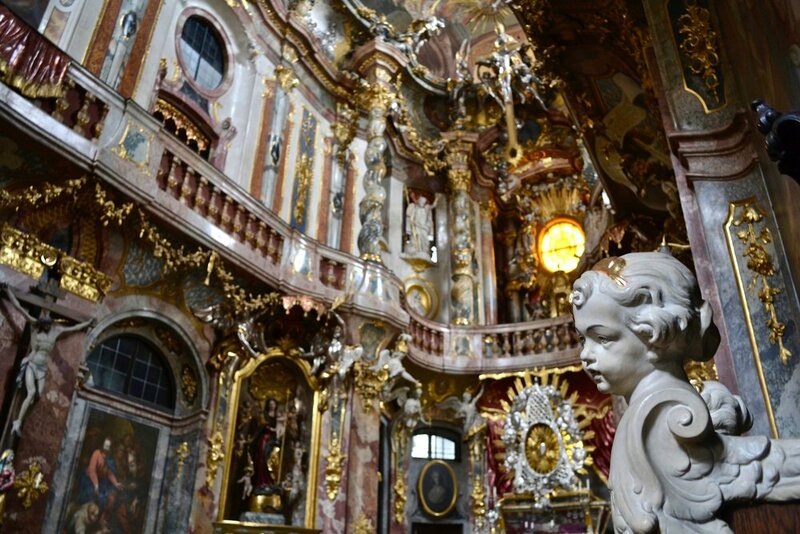 Ettal Abbey (Kloster Ettal) is another example of an 18th-century artistic treasure that every interested tourist should see if they have time. The abbey is located in the small hamlet of Ettal, which is in the very southern part of Germany near the Austrian border. In order to get to Ettal, I first took a train from Munich to Oberammergau (this did require a transfer at the town of Murnau). Upon arrival in Oberammergau, a visitor has the option to hike to Ettal. From Oberammergau, it is 7km (4.5 miles) to Ettal. For those that enjoy nature and are athletically-inclined, the walk from Oberammergau to Ettal is very pleasant since it goes through very picturesque areas with beautiful nature. In addition, there usually are not that many other people doing the hike, so it gives one a sense of solitude and allows for some reflection and thinking while walking. Upon reaching Ettal, the village is quite small, so it is extremely easy to find the abbey. Just follow the main road, and you'll eventually come upon the abbey. It is the largest building in the village and is located in the center. It is impossible to miss. Of all the places I visited in southern Germany, the Pilgrimage Church of Wies (Die Wieskirche) is easily one of my personal favorites. I had wanted to see this place for years, and I was not disappointed when I walked inside for the very first time. During my travels, I have been to many historic churches throughout the world, and this one is probably one of the most ornately decorated. 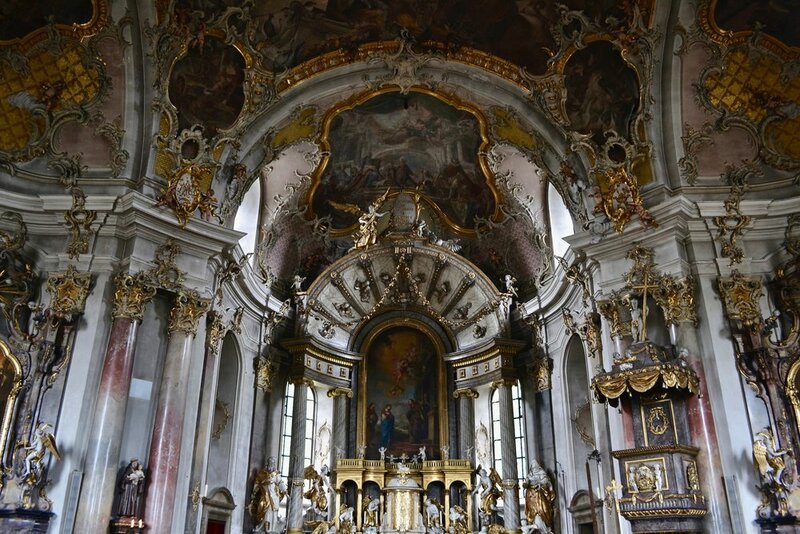 Even though the church is relatively small, one can easily spend quite a bit of time exploring the interior and examining all the intricate details of the stucco work and paintings. Whenever I look at pictures I took of the interior in 2014, I still find things I had not noticed before. 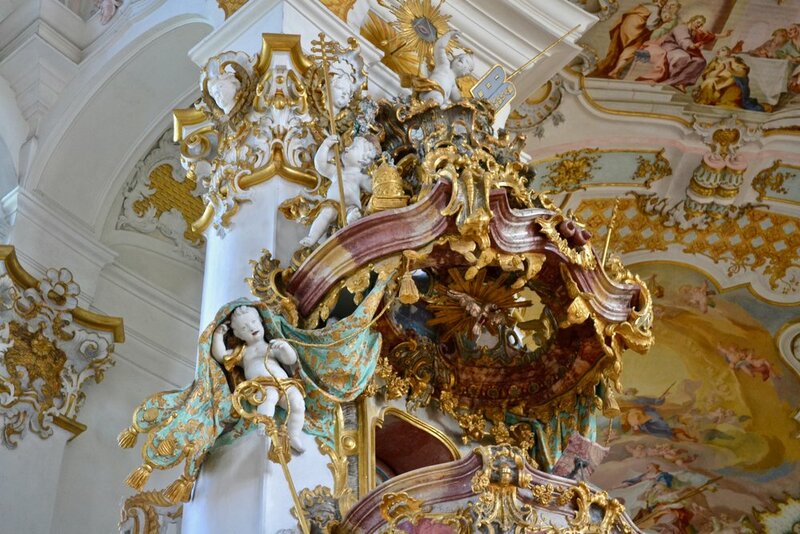 Because the church is so heavily decorated in an 18th-century rococo style, the architect, Dominikus Zimmermann, believed it to be his crowning achievement. As a result, he spent the last eleven years of life in the home (now restaurant) right across from the church. The church is located essentially in the middle of nowhere which gives it a very pastoral and idyllic setting, especially on nice days. The nearest small town is Steingaden, which can be walked to in about an hour. In my opinion, the best way to visit the Pilgrimage Church of Wies is to either go with a tour or rent a car and drive. If you don't have a car, it can be a little of a challenge to get to since it will require taking trains and buses, but it is certainly not impossible. 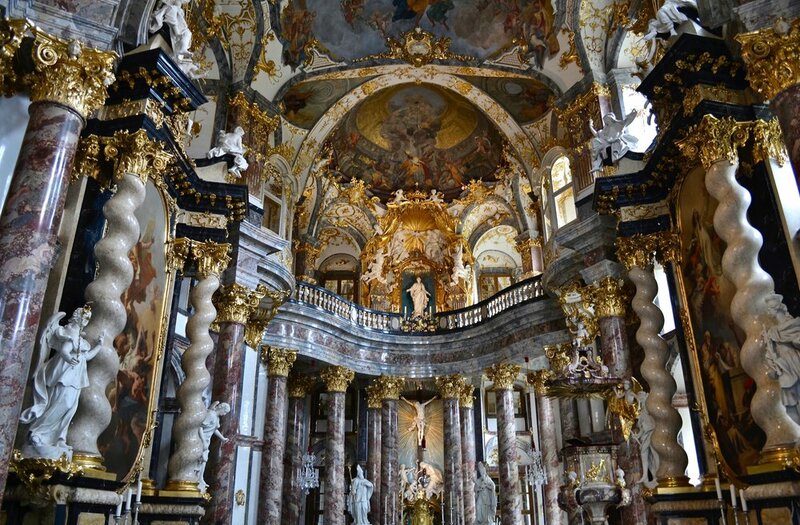 I was able to visit both Ettal Abbey and the Pilgrimage Church of Wies in one day. In order to do this, I first took a train from Munich to Oberammergau with a transfer at Murnau. Upon arrival at Oberammergau, I walked 7km to Ettal. I then took a bus to the Wieskirche/Steingaden bus stop from Ettal. The Würzburg Residence (Würzburger Residenz) is a palace located in Würzburg, which is in the northeastern part of Bavaria. 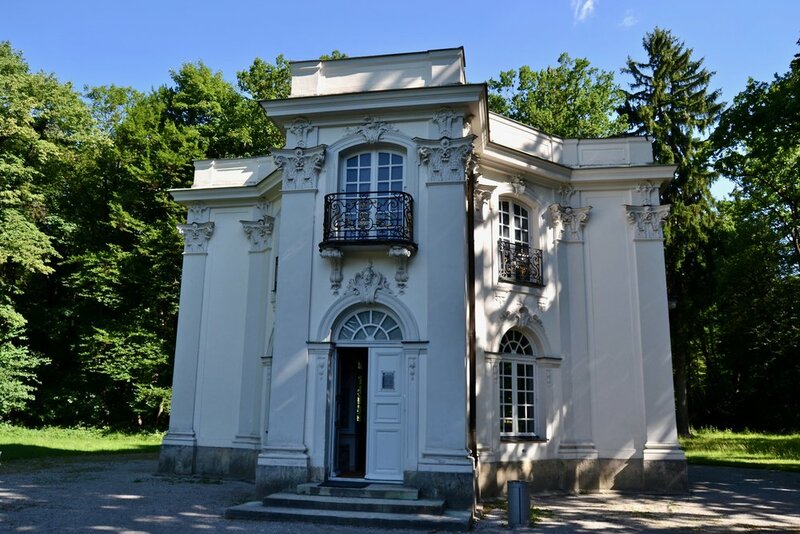 It was built as the residence of the Prince-Bishop of Würzburg in the 18th century and boasts works by some of the most famous names in art of the period, such as the famed Venetian artist, Giambattista Tiepolo. The city of Würzburg is quite easy to reach by train from Munich although the ride will take about 2 hours. Because Würzburg is a bit further afield than some of the other places on this list, it might be a good choice to stay overnight in order to explore the city in more detail. When I visited, I made this place a day trip since my main goal was to see the Residence, which is easily the most famous attraction in the city, but I also spent time exploring the city and found several other beautiful attractions (check out #8 on this list). Southern Germany has many quaint small towns that have a charm that can't usually be found anywhere else. 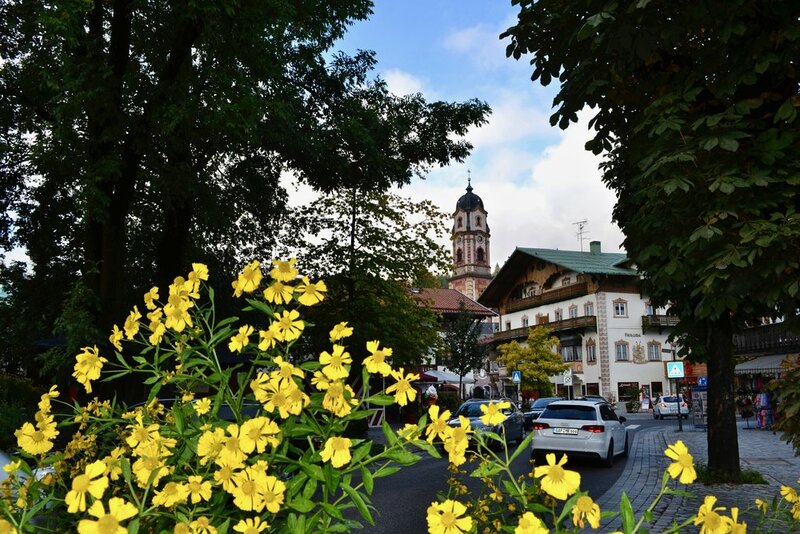 Mittenwald is a perfect example. It is a small town that has a traditional charm that you would be hard-pressed to find in a larger city. In a way, it really represents the epitome of a small Bavarian town. Strangely enough, I first became aware of Mittenwald not by travel websites or blogs but by a music video from a German singer. As I was browsing YouTube one day, I came upon a music video that said took place in Mittenwald. As I watched the video, I was attracted most by the beautifully-painted buildings. Indeed, the town of Mittenwald and also Oberammergau are famous for Lüftlmalerei, which are the scenes painted on the front of many private homes and businesses. These scenes often show religious scenes but also more rustic and pastoral scenes of life in Bavaria in the 18th and 19th centuries. They can be quite impressive and are definitely worth seeing. Unlike the other sites which are sprinkled throughout the southern Germany outside of Munich, the Asamkirche is in Munich, and it is extremely accessible. In fact, it is almost hard to miss. Any visitor to Munich will most certainly pass by this place. The only reason why it might be possible to miss is because it is relatively narrow, and it can be very easy to walk right past if you're not paying attention. The Asamkirche was the private church of the two Asam brothers, Cosmas Damian and Egid Quirin. They were two brothers who were essentially jacks-of-all-trades since they functioned as painters, sculptors, stuccoists, and architects in the 18th century. 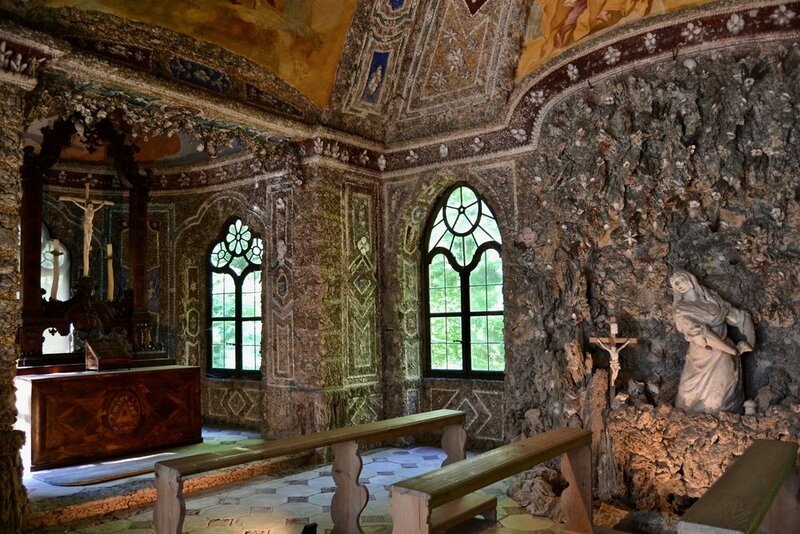 Today, their work can be seen in many churches, monasteries, and abbeys throughout the region in mostly smaller Bavarian towns and Austria. Some of the towns and villages where their other works are found can be a little bit difficult to reach using public transportation, so a car would be the best option. However, for a visitor who would like a taste of what kind of art they made and does not necessarily have the time to make it to the more remote places, the Asamkirche is a perfect example since it is located in a heavy tourist area of Munich, and it is free to enter although donations for the upkeep of the church are always welcomed. 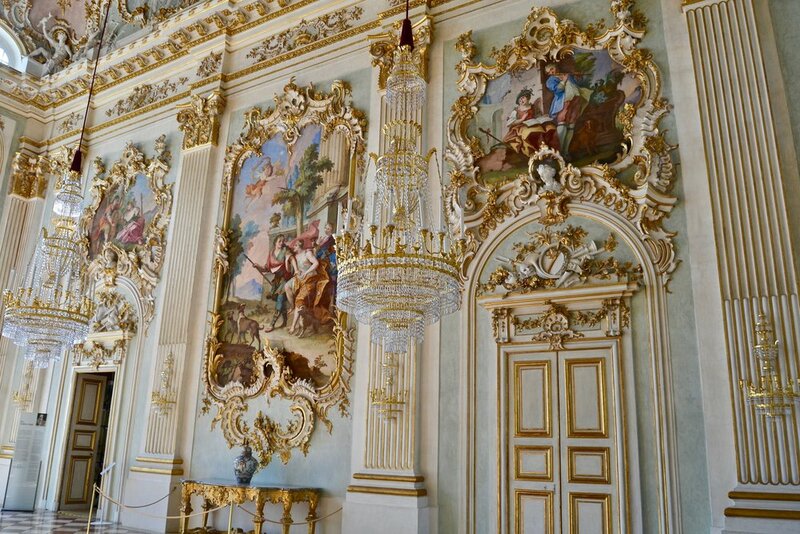 Nymphenburg Palace is located in Munich and is extremely easy to get to from central Munich via public transportation. In fact, from Munich Hauptbanhof, it is possible to catch a tram that stops almost right in front of the Palace. The travel time is only about 20 minutes, so this is definitely a must-see site for any visitor to Munich. For me, I've made it something of a tradition to stop here whenever I have a long layover in Munich and have a free day. My particular favorite part of visiting is just walking around the grounds and taking in the scenery and enjoying the solitude. In a way, it is hard to believe this place is located right in the center of Munich. For a first time visitor, it is recommended to get a combination ticket. This will allow for entry into the palace and the various smaller ancillary structures known as garden pavilions that are sprinkled throughout the ground. There are four pavilions total (the Pagodenburg, the Badenburg, The Magdalenenklause, and The Amalienburg). Each of the pavilions can be accessed with a ticket and are definitely worth seeing if you are a first-time visitor. The grounds also hold a classical monopteros which is excellent for photo ops. Of course, if you choose to not to enter the palace or pavilions, the grounds are free of charge, and it is quite nice to just stroll the grounds at any time of the day. The area is big enough so that you often feel like you are the only person there. The Käppele (Wallfahrtskirche Mariä Heimsuchung) is another interesting attraction in Würzburg that should not be missed. 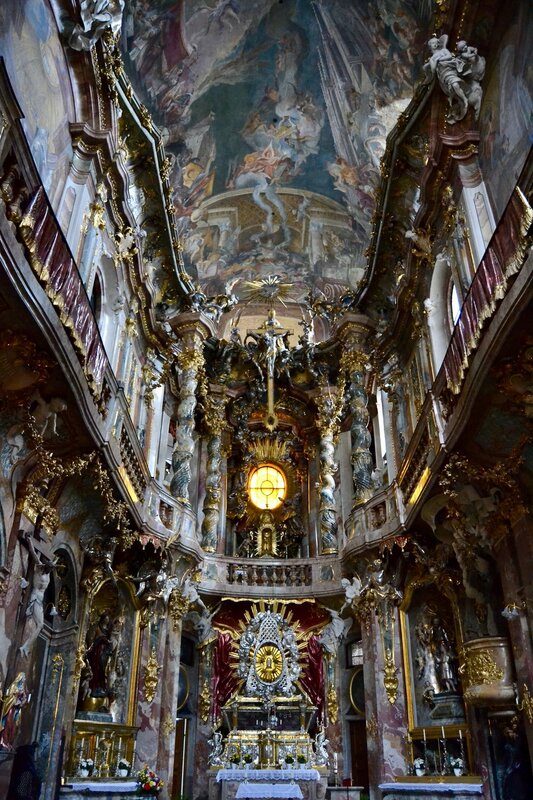 The 18th-century pilgrimage church is located on a hill in Würzburg that overlooks the city and presents many beautiful photo ops. It can be a little bit of a walk from the city center, but it is definitely worth it since it presents a beautiful view of Würzburg, and the church itself is veritable feast for the eyes since it is very ornately decorated in an 18th century style. As one approaches the church, a visitor will pass by 14 stations of the cross with small chapels on each side of the path that includes life-sized statues reenacting the crucifixion. Schleissheim Palace is another royal palace that is located a short distance from Munich in the suburb of Oberschleissheim, which is slightly north of Munich. It is very easy to reach via public transportation, and it only takes about 35-40 minutes of travel time. 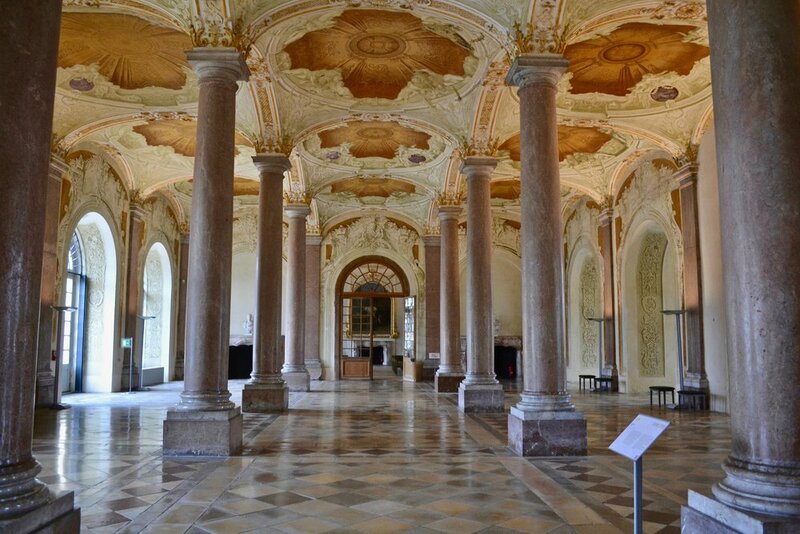 Admittedly, Schleissheim Palace, in my opinion, is not as grand nor as ornate as Nymphenburg Palace, but it is definitely worth visiting, especially if you enjoy fine art since the art galleries hold many beautiful pieces from the 17th and 18th centuries. The art gallery inside the palace is quite beautiful and features works by many well-known 17th and 18th century painters. Like Nymphenburg Palace, which has several ancillary structures on the grounds, Schleissheim Palace also has a smaller palace known as Lustheim Palace. 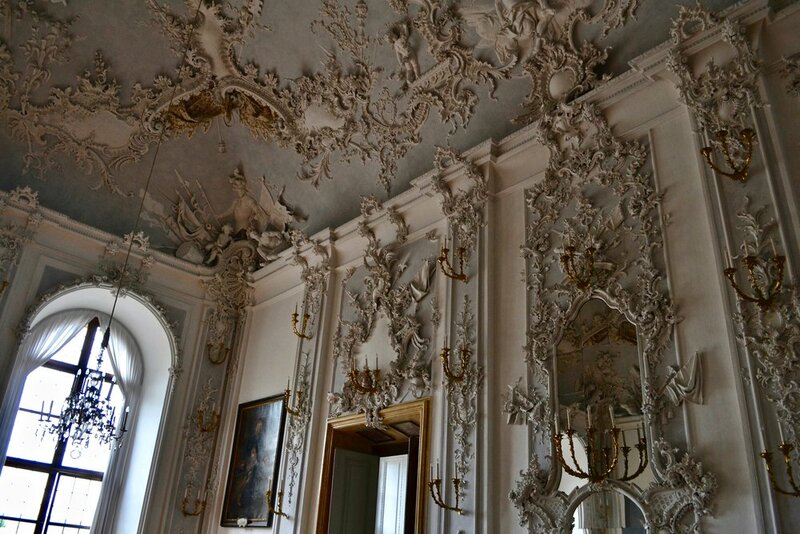 Lustheim Palace houses beautiful ceiling frescoes, and for those that are interested in decorative arts, there is also a museum dedicated to Meissen porcelain in the basement. Neuschwanstein Castle (Schloss Neuschwanstein) is easily the most famous site in southern Germany and probably all of Germany. No visit to southern Germany is complete without a visit here. 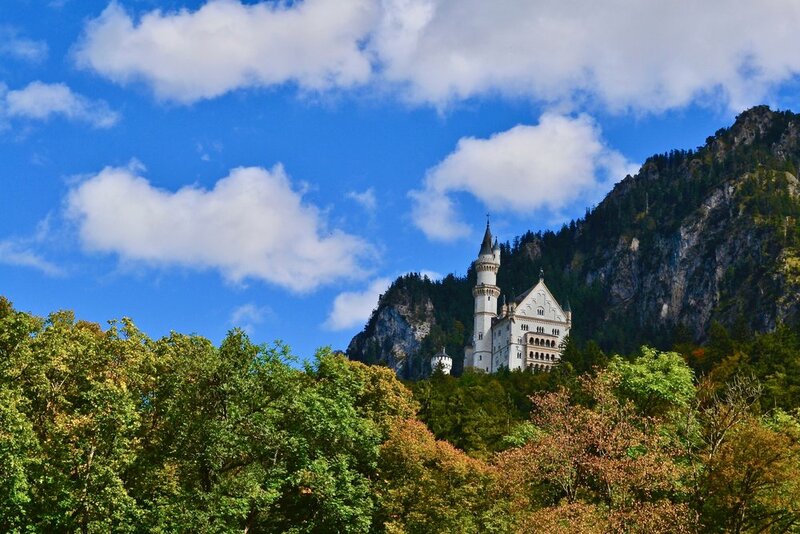 Neuschwanstein is colloquially known as "The Fairytale Castle," and it is one of the three fantasy castles that King Ludwig II commissioned in the late 19th century. 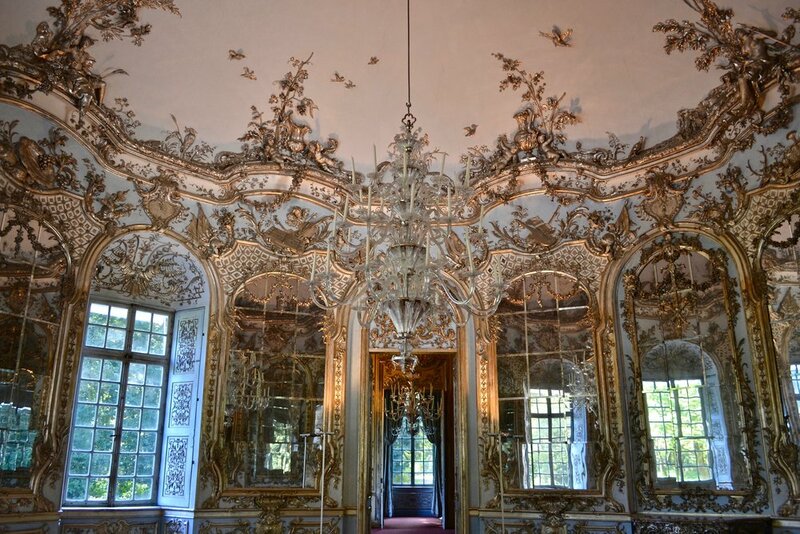 The other two castles, Herrenchiemsee and Linderhof can also be visited as well. Neuschwanstein Castle is located near the town of Füssen and receives around 2 million visitors from all over the world per year. In addition to Neuschwanstein Castle, the significantly smaller castle, Hohenschwangau, is right next to Neuschwanstein and can be visited as well. It is possible to travel here independently since it is easy to reach Füssen from Munich. However, it is just as easy to join a tour and not have to worry about dealing with transportation to and from. While it is possible to visit as a day trip, it would also be a good idea to overnight in Füssen and explore some more sites that are around the area.